Nasturtium ‘Scarlet Munchkin’ & some carefully placed docks. To be honest I don’t think my ‘Scarlet Munchkins’ are all that scarlet…more like ‘Funky Lava’…but they are Munchkins that’s certain. These were a piece of cake to grow from seed…either directly in the soil from mid to late April…or by starting them in pots….though try not to disturb their roots. As cut flowers they are completely and utterly useless…well you could float them in a bowl of water with candles and pretend you are married to a footballer… but far and away they are best used in salads…as they make a right tasty little nibble. 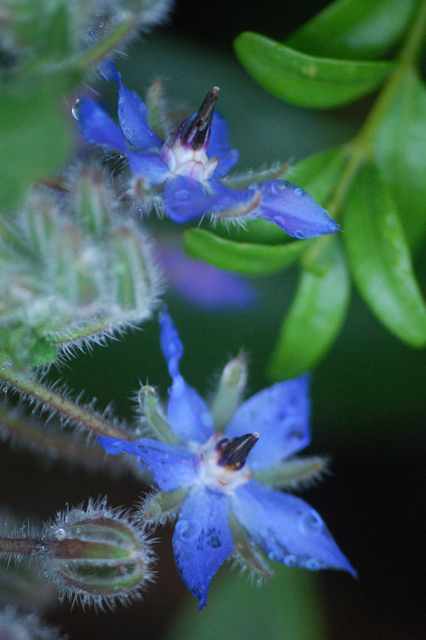 The flowers are fairly peppery…slightly hot…try them in a salad with Borage flowers…which are slightly cool. This hot cool combo salad will NO doubt be the MUST HAVE salad of 2014….oh yes indeed….you heard it here first. 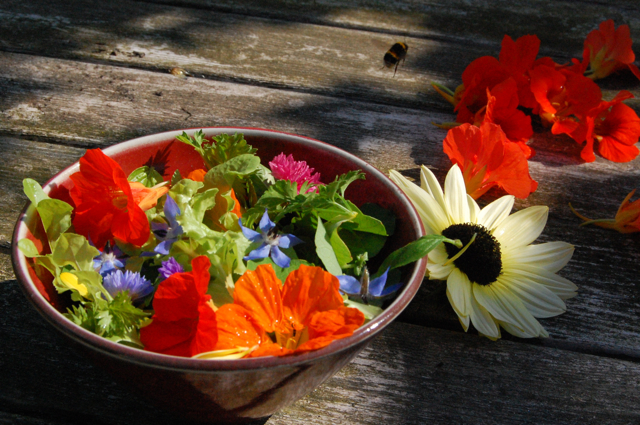 Creating a salad with edible flowers makes all the fair maidens round about start swooning and writing poetry about flower farmers with ‘nice but dim’ dogs. #fact. 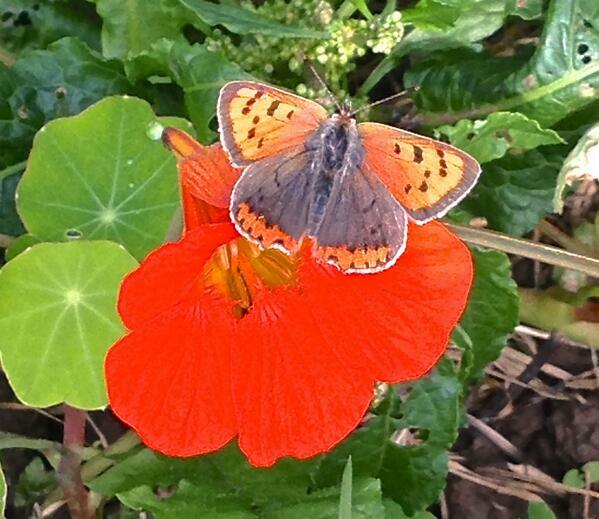 Yesterday in the flower garden, Deborah…secret photographer for Mark of @10minutegardener fame snapped this little beauty feasting on the Nasturtium banquet. 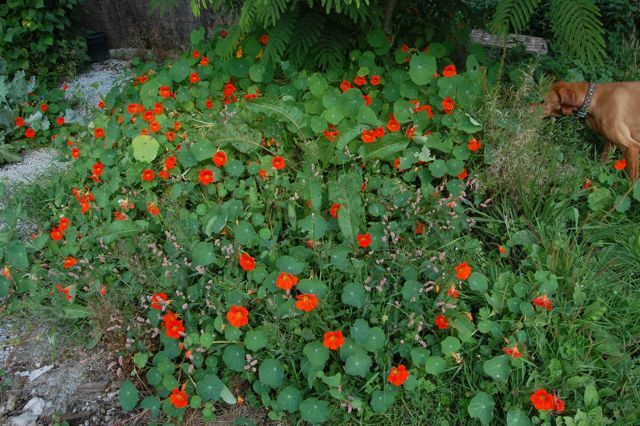 ‘Small Coppers’ like a wide range of food, so a cut flower patch with heaps of varieties is just what they are after. It’s been a tough couple of years for these critters so we are delighted to have them in our field…the butterflies that is…not Mark and Deborah. ‘Scartlet Munchkin’ Seeds are £1.95 for a packet of 30ish seeds. Hope you are all having a swimmingly good weekend…it is right dandy here in sunny Cornwall today. Calendula Officinalis	Grow Candytuft ‘Crown’ From Seed.